We can do great things with a good education. Dexter didn’t buy into the foolish notion that school is a waste of time. He stayed with his studies, and learned to do some pretty cool stuff as a result. Life is a lot easier if we get along with our siblings. 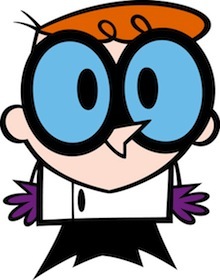 Dexter’s older sister Dee Dee likes to get into his business and poke around his “secret” lab, which he never manages to keep secret from Dee Dee. It just goes to show that a trusting and loving relationship with family can avoid all sorts of craziness. Never underestimate your big sister. Dee Dee is kind of hyper and not as bookish as Dexter. Still, she always manages to foil all of Dexter’s elaborate attempts to keep her out of the lab. She even has to help him out of trouble much of the time. It teaches us the value of common sense, and the error of misjudging people. We all get older soon enough; enjoy childhood as long as you can. In one episode, Dexter decides to make himself older so he can stay up late and watch TV. Trouble is, he’s too old now to stay awake late enough to catch the late movie. Learn to balance work with play time. In the episode Dimwit Dexter, Dexter finds discovers that he’s losing his smarts because he’s been working and studying too hard. He wasn’t spending enough time away from his work to rest and regenerate, so his mind went mushy. Honesty is the best policy; cheaters never win. In Chubby Cheese, Dexter tries to rig an arcade machine at Chubby Cheese Pizza so he can beat Dee Dee at Whack the Weasel. He not only fails to win, he gets caught by security as well. Be Yourself. When Dexter tries to become something or someone else, like in Don’t Be a Hero, his plan always backfires. He can’t fake being anything other than who he really is. We learn from Dexter that the person that we truly are is good enough, and there’s no need to pretend. It’s OK to ask for help when you need it. Dexter’s inventions and schemes always get him in a bind. He needs to depend on Dee Dee to bail him out, and sometimes (Last But Not Beast) the help of the whole family is required. Both mind and body require exercise. With all of his genius, Dexter is still inept at some basic physical skills. He places so much emphasis on his brains that he neglects his body and its need for development too, so he always fails that one important school class, P.E. Pride goeth before a fall. The old proverb is proven time and time again by our squirt-sized science hero. As much as Dexter prides himself on his superior intellect, he generally winds up being humbled. We learn that humility and acknowledging our flaws are just as import as excelling in our strengths.